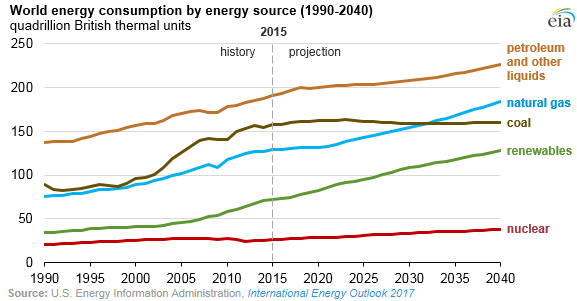 The U.S. Energy Information Administration’s latest International Energy Outlook 2017 (IEO2017) projects that world energy consumption will grow by 28% between 2015 and 2040. Most of this growth is expected to come from countries that are not in the Organization for Economic Cooperation and Development (OECD), and especially in countries where demand is driven by strong economic growth, particularly in Asia. Non-OECD Asia (which includes China and India) accounts for more than 60% of the world’s total increase in energy consumption from 2015 through 2040. Through 2040, the IEO2017 projects increased world consumption of marketed energy from all fuel sources, except for coal demand, which is projected to remain essentially flat. Renewables are expected to be the fastest-growing energy source, with consumption increasing by an average 2.3% per year between 2015 and 2040. 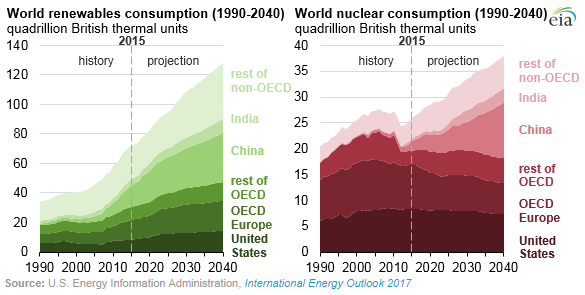 The world’s second fastest-growing source of energy is projected to be nuclear power, with consumption increasing by 1.5% per year over that period. Even though IEO2017 expects the nonfossil fuels (renewables and nuclear) to grow faster than fossil fuels, fossil fuels still account for more than three-quarters of world energy consumption through 2040. Natural gas, which has a lower carbon intensity than coal and petroleum, is the fastest-growing fossil fuel in the outlook, with global natural gas consumption increasing by 1.4% per year. The relatively high rate of natural gas consumption growth is attributed to abundant natural gas resources and rising production—including supplies of tight gas, shale gas, and coalbed methane. Although liquid fuels—mostly petroleum-based—remain the largest energy source throughout the IEO2017 projections, the liquids share of world marketed energy consumption is projected to fall slightly, from 33% in 2015 to 31% in 2040. As oil prices rise, energy consumers are expected to turn to more energy-efficient technologies and switch away from liquid fuels where possible. Compared with the strong growth in coal use in the 2000s, global coal use remains flat in EIA’s international projection. Coal is increasingly replaced by natural gas, renewables, and—in China and a few other countries—nuclear power for electricity generation. Demand for coal in industrial processes is also expected to slow. China is the world’s largest consumer of coal, but coal use is projected to decline in China by 0.6% per year from 2015 to 2040. In OECD countries, coal’s expected decline is similar, falling by 0.6% per year. The coal share of total world energy consumption declines significantly over the projection period, from 27% in 2015 to 22% in 2040. World coal consumption would be even lower in 2040 were it not for the projected increases in its use by non-OECD Asian nations outside of China. EIA’s IEO2017 presents an assessment of long-term world energy markets. IEO2017 energy consumption projections are provided for 16 regions of the world divided according to OECD and non-OECD membership. Projections for the United States in IEO2017 are consistent with those released in the Annual Energy Outlook 2017. The IEO2017 report focuses on energy markets through 2040, but all projections of energy consumption and production are available on an annual basis through 2050 in the International Energy Outlook online table browser.